In an unprecedented and unforeseen move, the UK Government has announced that, following the formal departure of Britain from the European Union in seventeen months’ time, all government ministries will be merged into a single superdepartment to be known as the National Scapegoating Agency (NSA). Want to feed your family? Then join the army!!!! Cold? Hungry? Ill? 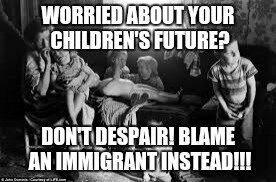 BLAME A FOREIGNER!!! Want to keep warm this winter? BURN AN IMMIGRANT!!! Asking about the £350 million we were apparently going to spend on the NHS is an act of treason punishable by death. Whoever gave you permission to read this?! Keep your eyes on the pavements, you dogs! The cost of the poster campaign will be covered by European Union funding.